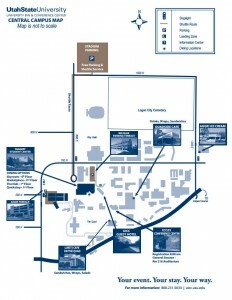 Below is a map of the USU campus showing the parking and dining locations and the location of the Eccles Conference Center. Click the map to see full-size. You may park at either the Aggie Terrace or the Big Blue Parking Terrace all day for $5.00 if you purchase a pass that will be sold at the conference. Or you may park at the stadium for free and ride the shuttle. See this link for more information about dining options on campus.